Many of us (me included) grew up in the 1950's. We would sneak around, wear our mother's shoes, dresses and wear her makeup. There are parts of of this story that resonate with us. We were all sneaks. Enjoy! StoryCorps—the acclaimed American oral history project associated with NPR—has made collecting, preserving, and sharing the experiences of LGBTQ Americans an explicit part of its mission for a while now under the OutLoud initiative. As my colleague June Thomas covered in an interview last year, StoryCorps founder Dave Isay has long been an advocate for the community—not least because his father, Dr. Richard Isay (who came out later in life), was central in pushing the American Psychiatric Association to stop treating homosexuality as a mental disorder. 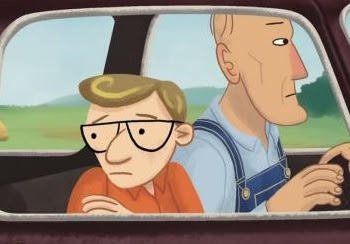 On Friday, StoryCorps OutLoud, with assistance from the It Gets Better Project, released an animated version of one of their most moving queer recollections—the story of Patrick Haggerty, a man who, as a teenager in 1950s rural Washington, began to realize he was gay, and how his dairy farmer father reacted to this emerging identity in a profound and surprising way. Wow, that was an awesome piece. I am so glad Pat such a understanding and loving father just like mine. I grew up in the 50s and 60s also.